It was written and is maintained by Clint Huffman, a Premier Field Engineer at Microsoft, and supports most major Microsoft server products. It reduces the amount of time required to review and analyze PerfMon logs by automating this analysis, saving you time by quickly highlighting potential problem areas requiring further investigation. PAL is available from Microsoft’s open-source community project, CodePlex. PAL has been tested on computers running Windows 7 × 64 and using the English-US locale. It can run on x86 operating systems, but x64 is recommended when processing large log files. You can download PAL from http://pal.codeplex.com. 1. Once installed, launch PAL from the Start menu. The Welcome page will be displayed, as shown in Figure 1. If you don’t have an existing PerfMon log to analyze, consider exporting a threshold file to create a counter log template. 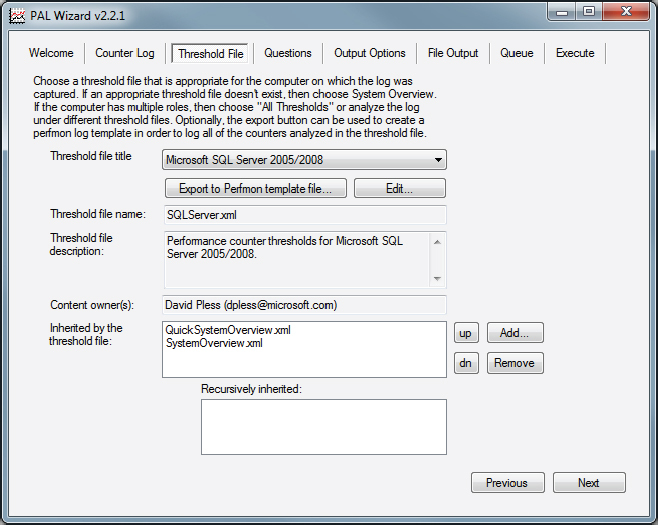 To do this, choose the Threshold File tab from the PAL interface, select the SQL Server 2005/2008 template, and click the Export to PerfMon Template File button. Export the template with an .XML extension for use on Windows 7 or Windows Server 2008 target machines. 2. 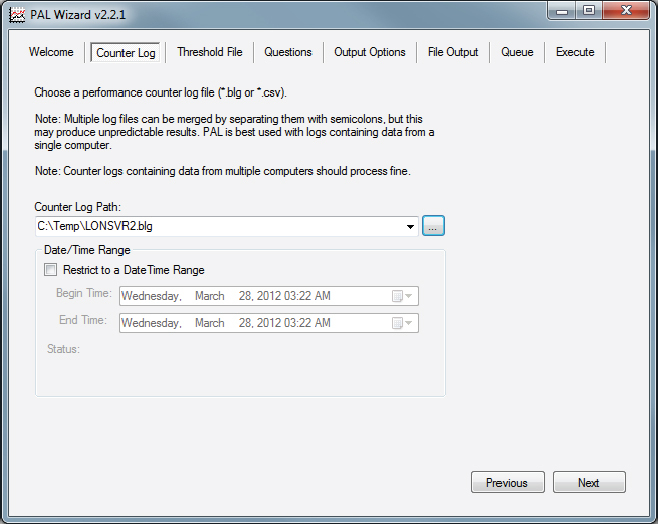 Select the Counter Log tab and browse to select the PerfMon log (see Figure 2). 3. Click Next or select the Threshold File option from the top menu bar (see Figure 3). Select the required Threshold File from the drop-down selection box. The current release doesn’t have a SQL Server 2012 template, so the SQL Server 2005/2008 template will provide the closest match (these templates can be configured/adapted as required). 4. On the Questions tab there are five additional questions to answer. Responding to these questions will provide output with thresholds tailored to the server on which the PerfMon log was captured. Ensure that you count logical processors, not physical sockets, when choosing the number of CPUs. 5. Click Next or choose the Analysis Interval menu item. 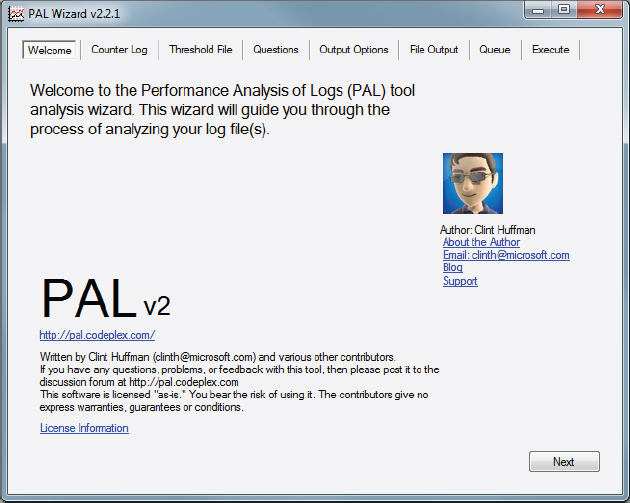 Here you can control the interval used by PAL to analyze the log files. Selecting All from the drop-down box means PAL will analyze every data point in the log file (this could be very many) and analysis will be lengthy. Leave this as Auto unless you have a specific reason to change it. 6. Click Next or choose the Output Options item from the menu bar. Here it’s possible to control the output types and location. The default settings are usually good unless something specific is required. 7. Move to the Execute tab, where usually the default settings are adequate. 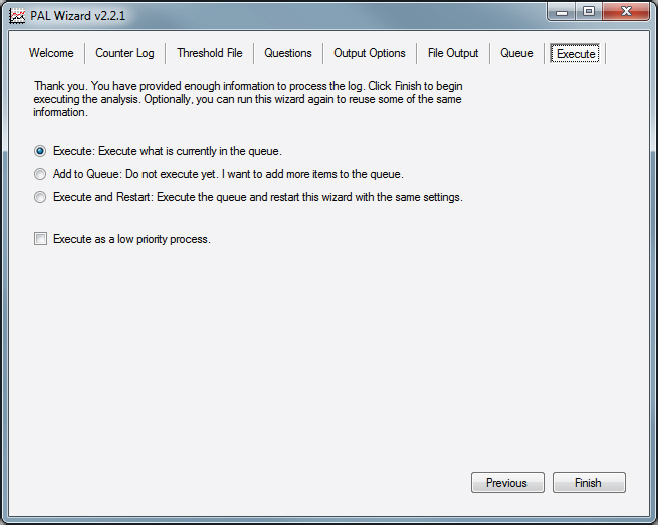 Click Finish to begin log analysis, which will launch the script (see Figure 4). Once the PAL tool has finished, an MHT file will be displayed in Internet Explorer containing the results. To get an idea of what this process entails, a recent 254MB log file analyzed by PAL on a quad-core computer took around 45minutes to analyze. The report produced by PAL analyzes performance metrics for the key hardware resources: Processor, Network, Disk, Memory, and SQL Server. The report is color-coded to help you quickly identify problem areas.